Speaking before the Players at Sawgrass, where he confirmed that he is also thinking of playing the Celtic Manor Wales Open two weeks before next month’s US Open, Harrington said: “I play the JP McManus Pro-Am that week and I would have found it a struggle to play a second pro-am later in the week. “But don’t worry, I will play something that week. I will host my own event if I have to. Or I could go to Loch Lomond. All I need is competition. “Competing is the main thing for me and it is all about competing at the end of the week. Maybe I will feel good enough after the Pro-Am (in Adare) that I have got enough competition in. “The Barclays Scottish Open (at Loch Lomond) is a strong possibility but I am just not sure. Having played the JP McManus Pro-Am in previous years I know that it does take a little bit out of you and maybe it is not the right thing to have a long week afterwards. But I will wait for the next couple of weeks to see how I feel about that. “I might have a little event for my close friends. I wouldn’t be averse to doing something like that. If it came down to that, it might be a 36-hole or 54-hole event for 20 pros. The Irish Region of the PGA wanted to hold its championship at The Island from July 8-10 - sandwiching it between the JP McManus Invitational Pro-Am and the following week’s Open. But Harrington’s failure to commit to the event at an early stage meant that the Irish Region lost The Island as a potential venue and the Irish Championship is now likely to be played in the Dublin area from September 23-26, clashing with the US Tour Championship in Atlanta. Harrington won the Irish PGA in 1998, 2004 and 2005 and used the event as a warm up for his Open victories at Carnoustie and Royal Birkdale when he triumphed at The European Club in 2007 and 2008. He completed a hat-trick of Irish PGA wins at the European Club last year but failed to to make it a double-triple when he finish tied 65th in the Open at Turnberry. It was also announced at Sawgrass that he is becoming a global ambassador for the Special Olympics. 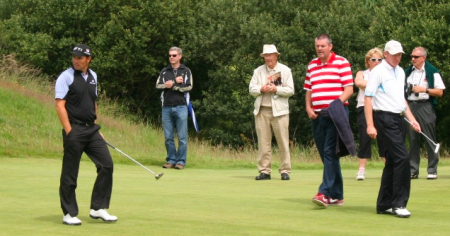 Harrington won the Irish PGA in 1998, 2004 and 2005 and used the event as a warm up for his Open victories when he triumphed at the European Club in 2007 and 2008. Harrington also announced at Sawgrass that he is becoming a global ambassador for the Special Olympics. Padraig Harrington's first port of call on his arrival at Turnberry was a driving range session with coach Bob Torrance. The Dubliner, fresh from his sixth Irish PGA win on Saturday, was seen hard at work on his takeaway with the venerable Scottish coach. Harrington and Bob Torrance on the range at TurnberryHarrington is bidding to become the first player since Peter Thomson in 1954-56 to win the Open three years in succession. Yet he confessed before leaving Ireland that his preparations have not been ideal as he fights to forget his swing thoughts and let his game flow freely. The media centre at the Open is as good as ever this year but the view from the patio at the back of the restaurant is simply stunning.